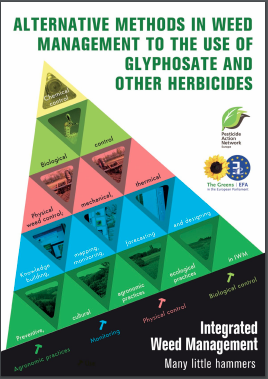 PAN Europe today has published an updated edition of its report on alternative to glyphosate as a contribution to the ongoing discussions among some Member States, led by France, on phasing out glyphosate and promoting alternatives. In the margin of next week’s gathering of the EU agricultural ministers (Tuesday 16th July), France will be organising a meeting with like-minded delegations to exchange on how to phase out glyphosate and promote alternatives. PAN Europe welcomes this forerunner initiative by the French and takes this opportunity to release the second edition of its report on ‘alternative methods in weed management to the use of glyphosate and other herbicides’. Last December, following glyphosate's reauthorisation, six ministers from France, Belgium, Luxembourg, Slovenia, Malta and Greece wrote a letter to the European Commission asking them to ”prepare the exit plan for glyphosate by supporting farmers to do so” (1). As France speeds up its efforts toward a phase-out, other like-minded Member States seem also eager to discuss next steps and share approaches in the exit plan for glyphosate. This PAN report shows that there is already knowledge and tools available to replace widespread herbicide use. It gives an overview of some of the ecological and mechanical techniques that can be used in combination, forming a toolkit of “many little hammers” to manage weeds, rather than relying on a “chemical wrecking ball”. This means moving from a logic of complete extermination, with associated biodiversity loss, to rather managing weeds, in line with the EU Directive on Sustainable use of Pesticides.